Hermit crabs are interesting to watch, especially as they grow. They must shed their tough exoskeletons and give their newly exposed skin time to harden. This is often when they switch shells. The molting process does one more amazing thing: It lets the crab regrow a claw if one is missing. 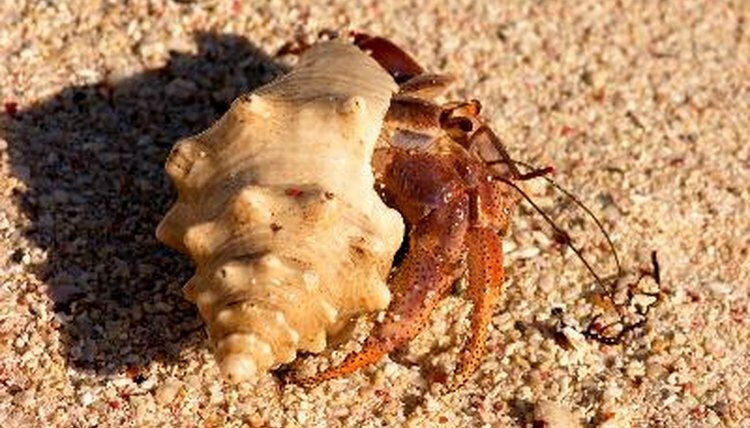 Your hermit crab might lose a claw for a variety of reasons, such as having an environment that's too dry. A crab can lose a claw due to the effects of light poisoning, such as from paint fumes or chemicals. If you have more than one crab in a single habitat, one might have pulled off the other's claw during a fight. A single crab could lose a claw getting it caught on something. If your hermit crab loses a claw, don't despair. Add a bowl with a wet sponge in the corner of the habitat to increase the humidity and help keep your hermit crab healthy. Mist him daily with water. Keep him away from strong fumes -- take the habitat outside if you're having your house treated with pesticides. There's no treatment for a crab missing a claw. His body will automatically begin working to repair the damage, so you don't need to interfere. As your crab begins to regrow his claw, you might see a gooey-looking blob, often white or light gray, at then end of the leg bud where the claw used to be. This is called a limb bud, and it's the beginning of your crab's new claw. It normally appears just before your crab molts. After molting, much of the new claw should be there and functional, although it sometimes takes two to three molting cycles for a claw to fully regenerate. A claw is not the only appendage your crab can lose. Many lose legs, for the same reasons they lose claws. The good news is that crab legs regenerate in the same fashion as claws, forming as limb buds just prior to a molting cycle. Even if your crab is missing a claw and a couple of legs, it's likely you'll see them all start to grow back the next time he molts.